Steele Hall's suite-style room arrangement offers opportunities for NSU students to enjoy community living in a smaller environment. 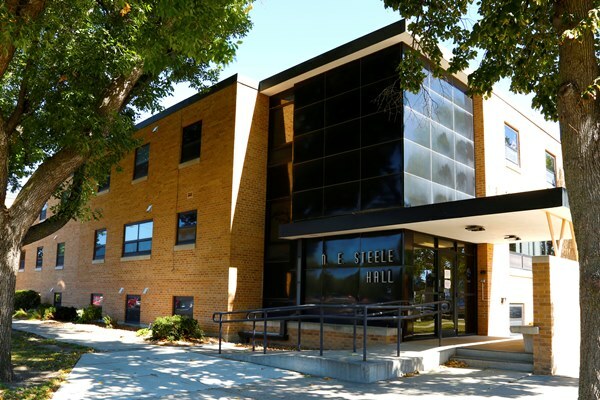 Steele Hall, located on the southwest edge of campus, offers our students four-person suites consisting of a living room and bathroom between two double rooms. Suites include extra-long twin beds, a micro-fridge, and bathroom with shower, toilet and sink. Desks, chairs, couches, tables, dressers and wardrobes vary from room to room. The main lobby, on the second floor, contains a lounge area, vending machines and flat-screen TV. Laundry and a lobby/kitchen with TV are on the first floor. Each floor has a kitchen area for residents. Wireless internet access is located throughout the hall, and individual rooms are wired for high-speed internet.